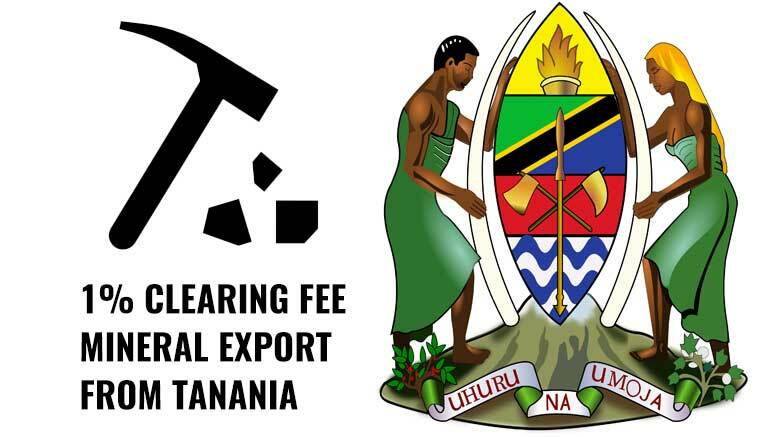 The Government of Tanzania will impose a clearing fee of 1% of the value of minerals export. Prime Minister Hon. Dr. Philip Mpango made the announcement when presenting to the National Assembly the estimates of Tanzania’s government revenue and expenditure for 2017/18. “The Government will not allow direct exportation of minerals from the mines to other countries and instead it will establish clearing houses at the international airports, mining areas and other appropriate areas where the minerals will be verified and issued export permit before being exported. The Government will impose a clearing fee of one percent of the value of minerals”, Mpango explained. The announcement follows the introduction in March 2017 of a ban on the export of mineral concentrates and ores for metallic minerals such as gold, copper, nickel, and silver. According to the Ministry of Energy and Minerals of Tanzania, the ban intends to make sure that mineral value addition activities are carried out within Tanzania. A subsequent committee was established to investigate the extent and type of minerals contained in mineral sand in containers in various locations in the country. The outcome of the investigation was released on 24th May 2017, identifying major discrepancies in the average concentration of the minerals, per ton of mineral sand, resulting in losses of revenue from royalties. However, Tanzanian largest gold miner Acacia Mining discredited the committee’s findings and is asking for an independent review. Meanwhile, the Tanzania Chamber of Minerals and Energy (TCME) commented that under the current situation some mines faces imminent closure because of the loss of revenues from the sale of concentrates, and demanded the uplift of the ban.